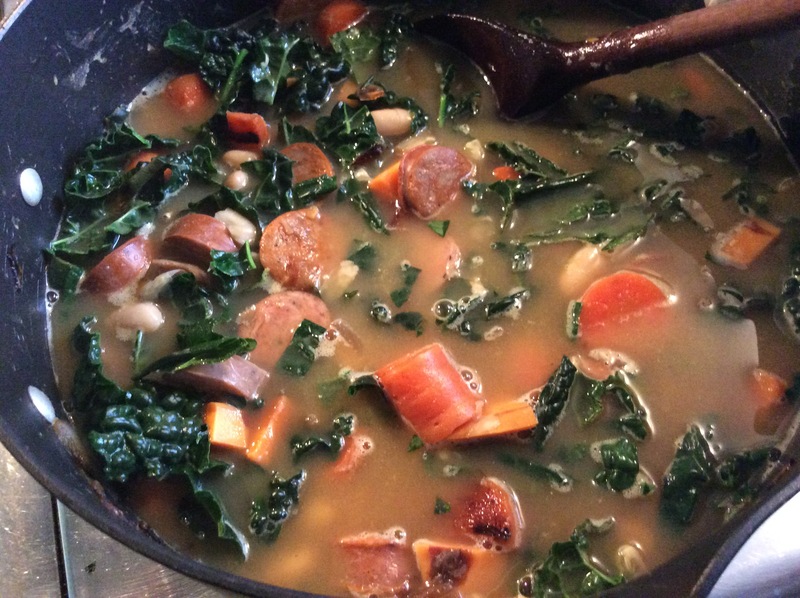 A hearty and delicious cool weather meal is this kale and white bean soup with added veggies, sausages, wine and lots of flavour. 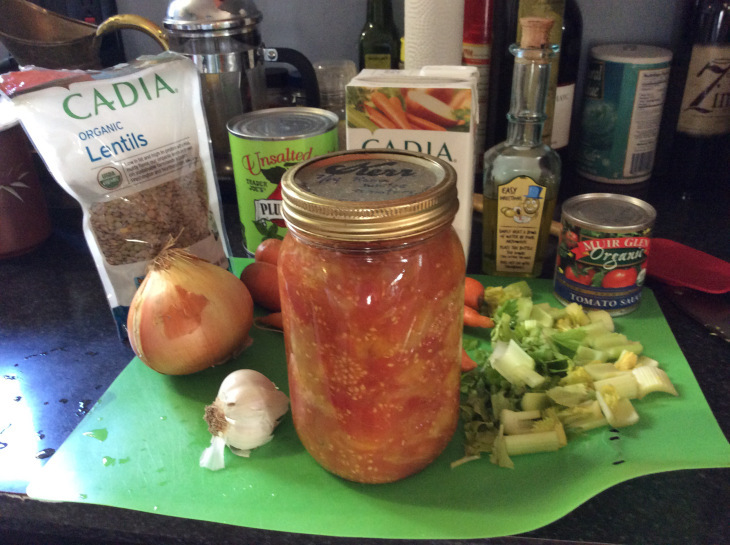 This soup has become our “go to” soup this winter; it’s very robust, filling, and has lots of other good healthy veggies, besides the kale. We also like sausages in it, but if you’re vegetarian you can omit them, and use vegetable broth instead of chicken. *If you’re interested in the recipe’s nutritional content, I’ve added a list at the end of the recipe (from a site that analyzes recipes). It seems to be pretty accurate although I think the sodium count is lower than on the list; (it is not totally specific for ingredients such as the sausages). 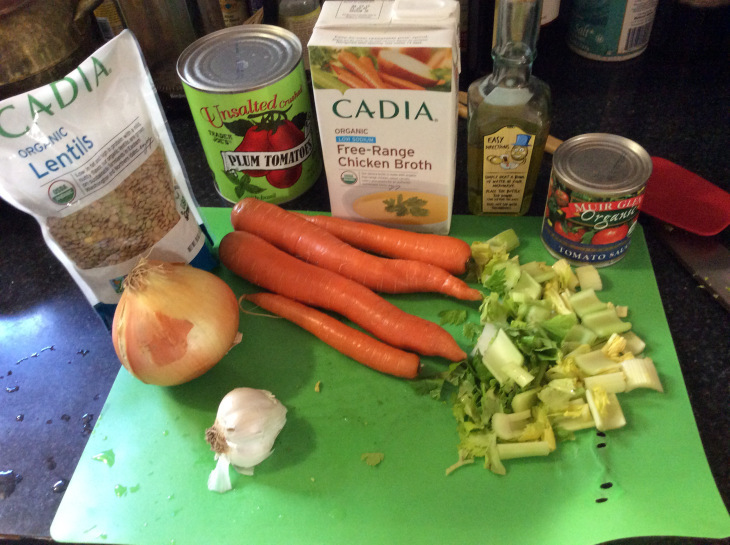 2 cans white beans- (cannelloni, Northern, etc. )- tip: mash about 1/3 of the beans with a large fork before adding to the soup. This thickens it without additional thickener like flour which adds unnecessary carbs. 1. Preheat large Dutch oven or soup pot. Add olive oil. 2. Add chopped onion, zucchini, Bay leaves and carrots. Brown and sauté on medium heat approx. 10 minutes, until somewhat tender. Add garlic and sauté 2 more minutes, making sure garlic doesn’t burn. 3. Add sausages, potatoes and beans, then kale and cook another 4-5 minutes until kale is a bit wilted. Add broth, wine and Spices except for lemon zest. 4. Bring to a boil, then cover and turn down heat to a slow simmer. 7. Add lemon zest and adjust spices and seasonings to taste. 8. Serve with the always delish green salad, and whole grain toast if you like. 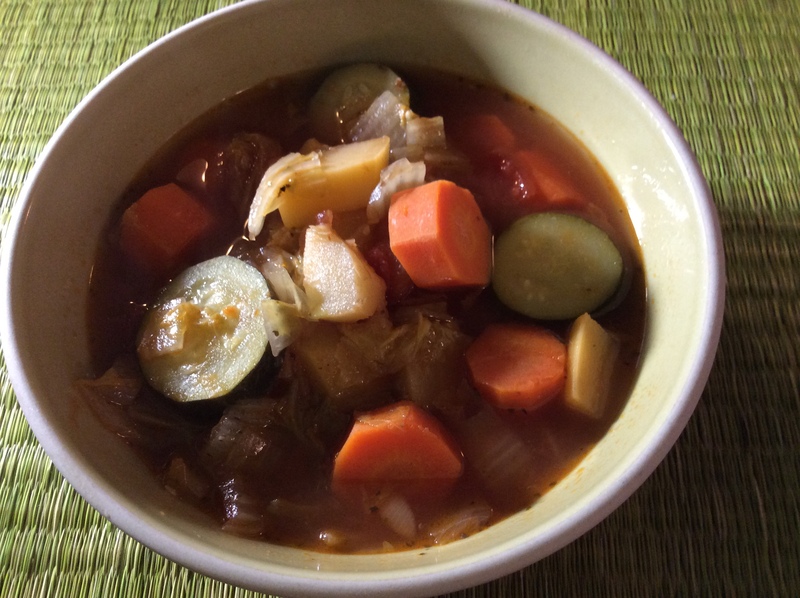 When the weather’s cold or rainy, (I live in California so our cold isn’t as extreme as much of the US, but we do get our chilly, rainy days), nothing satisfies like a hot, steaming bowl of soup, especially one that is full of seasonal vegetables like kohlrabi, parsnips, cabbage and onions. This soup is delicious, natch; plus very easy to make and chock full of ingredients that are very good for you. It can also be made ahead of serving. As you know, soup is always better the next day! 2-3 parsnips chopped into (yes- you guessed it) 1/2″ pieces- a chef told me that it really doesn’t matter if you have elegant chopping technique but that the point is to chop similar density food so that it is similar in size so it cooks approximately at the same time. 1-2 zucchini or winter yellow squash, chopped into 1/2″ rounds. 1. Heat oil in Dutch oven. 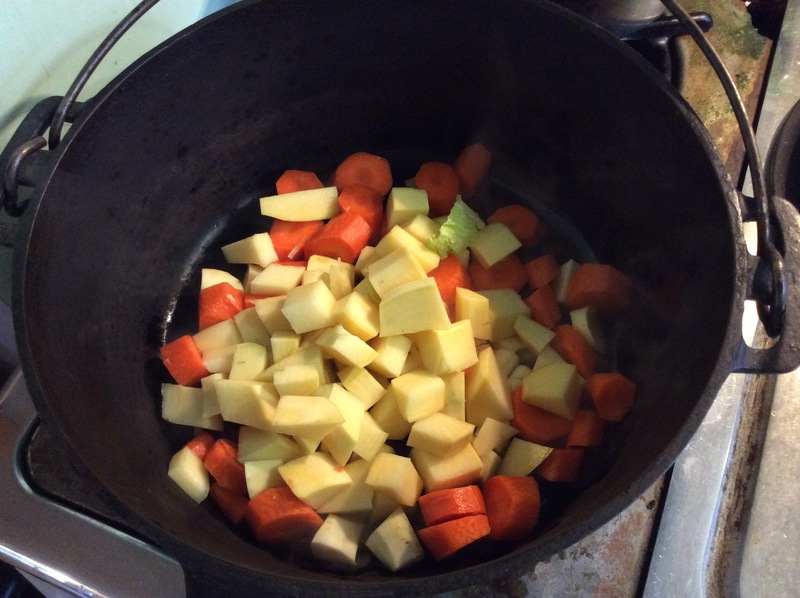 Add the kohlrabi, carrots, parsnips and saute for 6-7 min., stirring occasionally. 2. Add the chopped cabbage and saute 4-5 min. more. 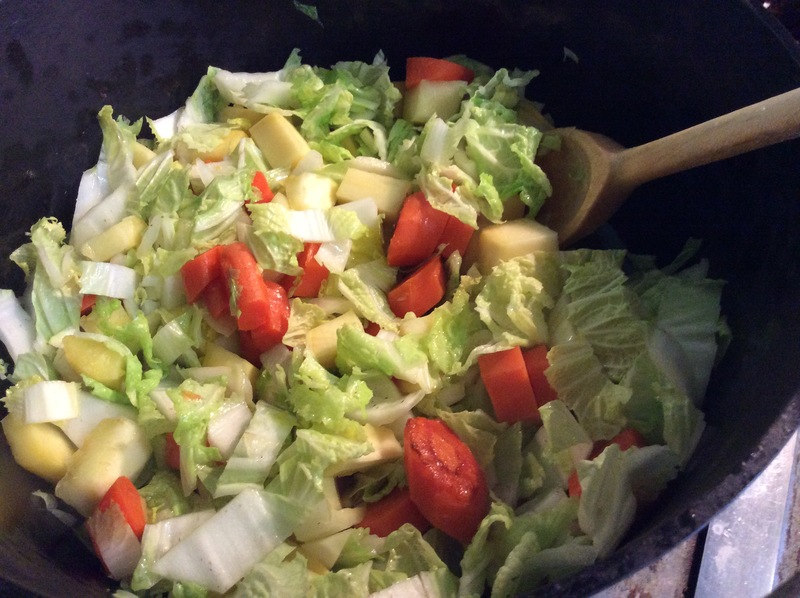 It will seem like a lot of cabbage but it cooks down. 3. Add the onions, garlic and shallots and saute a few minutes until they start to become translucent. Then add the zucchini and/or squash. 4. 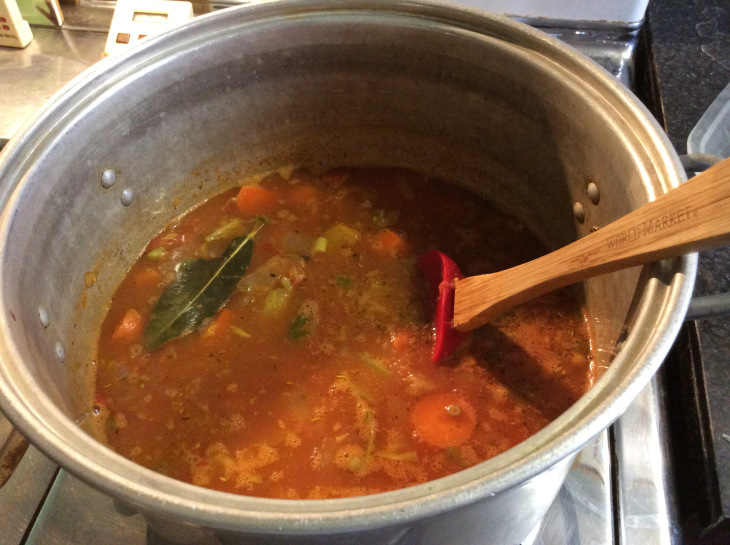 Add the tomatoes with juice, wine, stock, bay leaf and spices to taste. 5. Bring to a boil, then reduce heat and simmer for approximately 40-45 min. until the vegetables are tender but not mushy. 6. Optional: add chopped cooked sausage. Goodness is in the bowl! A hearty and delicious cool weather meal is this lentil soup, with added veggies, wine and lots of flavour. Lentils do have higher carbs but they are also are high in protein and fiber. Of course, you can moderate your amounts, depending on your own health situation. For more lentil nutrition info, go to the link marked * at the end of this post. 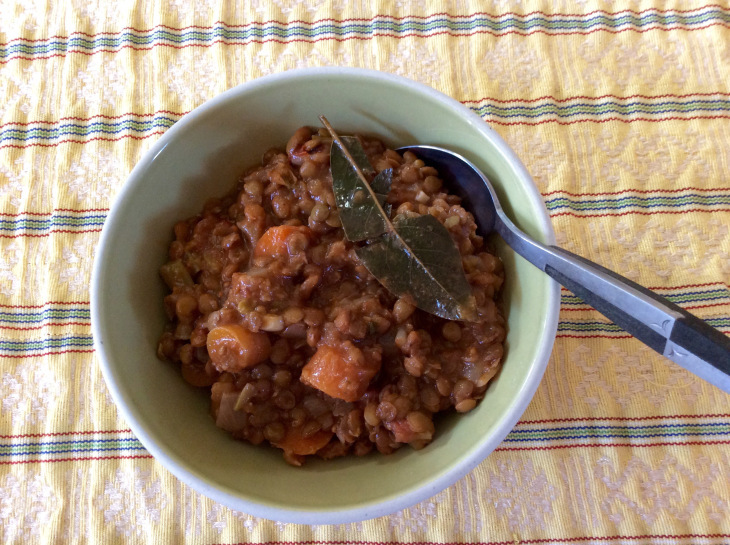 Some lentil soups are too watery, and some are too thick. This one has the right balance of broth and substance. You can also add other vegetables, and even bacon, but this is how I make it. I recently made this Soup with red lentils from a brand called “Pereg”— and was disappointed that these lentils never got totally tender, even after a lot of cooking- first one hour, then two subsequent cookings, (I made a large batch so we had leftovers), for 1/2 hr. To 45 minutes each time. Also I added cumin and all spice, so the flavor was interesting. All in all, still good, but next time I’ll stick with green or brown lentils. Have any of you, dear readers, had the same experience? 3/4-1 cup dried brown or green lentils, rinsed. 1. Preheat large saute pan. 2. Add olive oil, chopped onion, celery and carrots. Brown and sauté on medium high heat approx. 10 minutes, until somewhat tender. Add garlic and sauté 2 more minutes, making sure garlic doesn’t burn. 3. 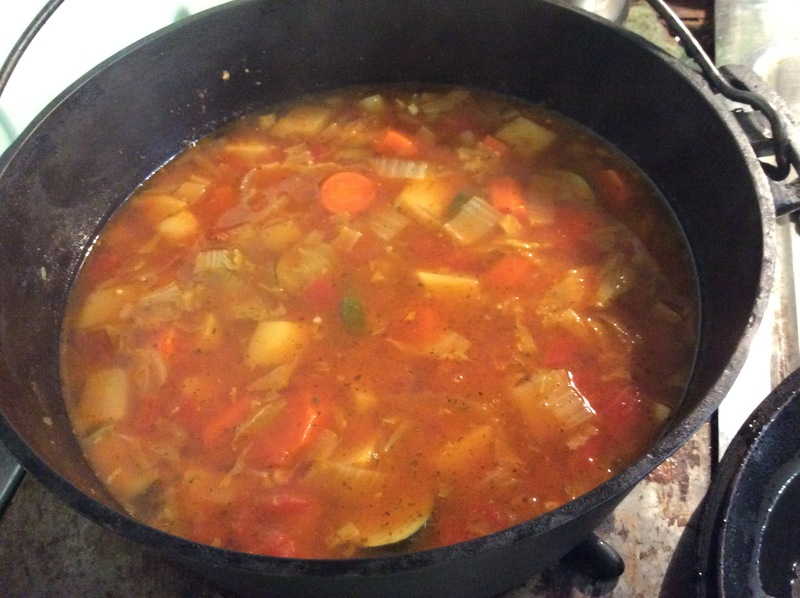 Add veggies to a large pot or Dutch oven. Add lentils, and rest of ingredients, except for lemon zest. And whole grain toast if you like. I also like a dollop of plain Greek yogurt to top off my bowl!